In Tokeet, you can easily view your booking revenue reporting in the "Reports" section of Tokeet. Select "Booking Revenue" to view metrics. Select different currencies. The report will display booking revenue for each currency in which you have reservations. Alternatively, you may export every single booking, with checkin / checkout dates, guest name, rental name, and other datapoints by using an Inquiry Data Feed, at Settings > Data Feeds. For more info, please see here. There are differences in how each API channel (Airbnb, Booking.com, Expedia) passes booking revenue to Tokeet. You can navigate to Inquiries and click on a booking to see the booking totals. Please see below for a description of how each channel passes booking revenue to Tokeet. 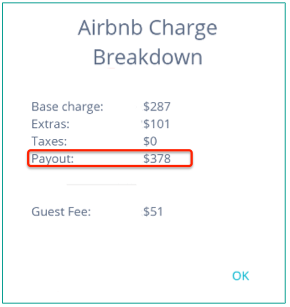 For each booking received from Airbnb, you can see a detailed breakdown of how the booking revenue was recognized. Click on "Breakdown" link under "Cancel Booking"